This tip comes from Paul Wollerman who kindly donated the picture. 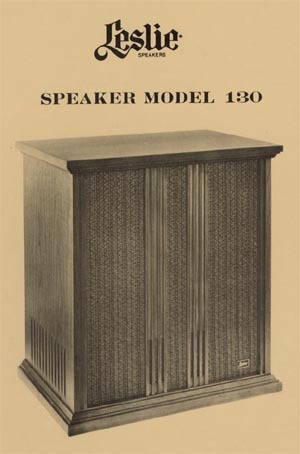 The Leslie cabinet model 130 is somewhat of an 'odd duck', the reason being that it has a rotating drum handling the bass and lower middle frequencies, but has a stationary treble speaker (tweeter). This makes the sound from the cabinet brighter than other 'horn-less' Leslie speakers but also a bit less Leslie-like. This is why some prefer to wire the amplifier directly to the 12" so that the entire frequency range is fed through the rotating drum, in essence creating a Leslie 825 or 820 in a wood cabinet. You can read more and see more pictures on the 130 in the Decorator Leslie section of this website. This is what the stock speaker system looks like. A black/orange pair of wires connects the amplifier with the crossover (left side of schematic), another pair of black/orange wires connects to the bass speaker, and a black/green pair connects to the treble speaker. On the left you can see the two wire pairs ending in spade lugs. These are the two outputs to the bass and treble speakers. The black/orange pair connects to spade lugs on the bass speaker. The input wire from the amplifier, also black/orange, enters the middle compartment of the speaker through a corked hole and connects to the 1st and 5th (from left) spade lugs on the crossover. The trick is simply to disconnect the wire from the bass speaker, disconnect the black/orange input wire from the crossover and move that wire to the now vacated terminals on the speaker. To secure the unused black/orange wire pair, one can connect it to the unused input terminals on the crossover. Below you can see crossover after the wire swap, as well as the black/orange pair now going to the 12" bass. I suppose one could fit a switch somewhere to actively switch between the two speaker configurations - maybe even with a relay so it could be remotely controlled. The cool thing about this modification is that if you don't like the sound after you did it, you can revert to stock operation in two seconds. The only tools needed is a flat-head screwdriver to get the back off the Leslie.